Christian Messier, Department of Biological Sciences at the Université du Québec à Montréal (UQAM) . “Immunizing" forests against global change: Linking network theory and functional diversity to increase resilience "
Human impacts on Earth’s ecosystems have greatly intensified in the last decades. This is reflected in unexpected disturbance events, as well as new and increasing socio-economic demands, all of which are affecting the resilience of forest ecosystems worldwide and the provision of important ecosystem services. I will briefly review the focus and limitations of past and current forest management and silvicultural practices mainly as developed in Europe and North America and then propose a novel approach to integrate the functionality of species-traits into a functional complex network approach as a flexible and multi-scale way to manage forests for the Anthropocene. Using this novel approach, the most efficient forest management and silvicultural practices can be determined, as well as where, at what scale, and at what intensity landscape-scale resistance, resilience and adaptive capacity of forests to global changes can be improved. 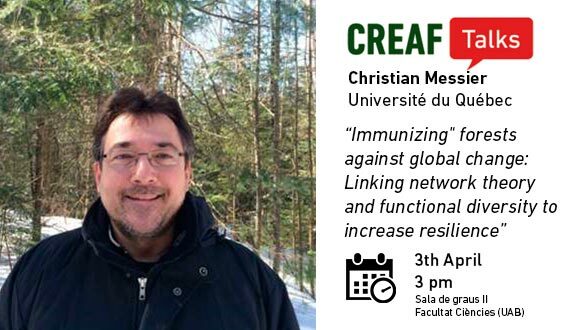 Christian Messier is a professor at the Department of Biological Sciences at the Université du Québec à Montréal (UQAM) since June 1991. His research focuses on the ecological and silvicultural factors that influence temperate and boreal forest ecosystem dynamics. Dr Messier holds the NSERC/Hydro-Quebec Chair on tree growth control. He was a member (and a co-leader from 1996 to 1999) of the Sustainable Forest Management network (SFMn) from 1995 to 2010. He is also the cofounder and an executive member of the Integrated Quebec Intensive Silviculture Network, a major project aimed at maximizing timber production on small areas. Finally, Dr Messier participated in the creation of the Centre for Forest Research (CFR) and was its director from its inception in 2006 to June 2010.